New class date of April 27th! Lacto-fermentation is the ancient art of preserving vegetables using salt. The use of salt in an anaerobic environment inhibits pathogenic bacterial growth and allows only the lactic acid bacteria to thrive, converting natural sugars of vegetables into zingy, tangy, sour, umami! Usually preservation happens BEFORE the lean times of winter, but this intro course will prep you for the upcoming bountiful harvests of the spring and summer seasons as well as help get your palate through the rest of those bland winter doldrums with the creation of a zesty and healthful side dish/condiment. This is an interactive workshop geared for the newbie fermenter and will begin by priming your palette with SAMPLES of some recent fermentations made by the facilitators whilst discussing the health benefits of lacto-fermented foods. You will learn both brining and salting methods of lacto-fermentation to begin making your own pickles, krauts, hot sauces, and kimchis. You will then have the opportunity to make a small-batch ferment of your choosing based on the produce and spices provided. 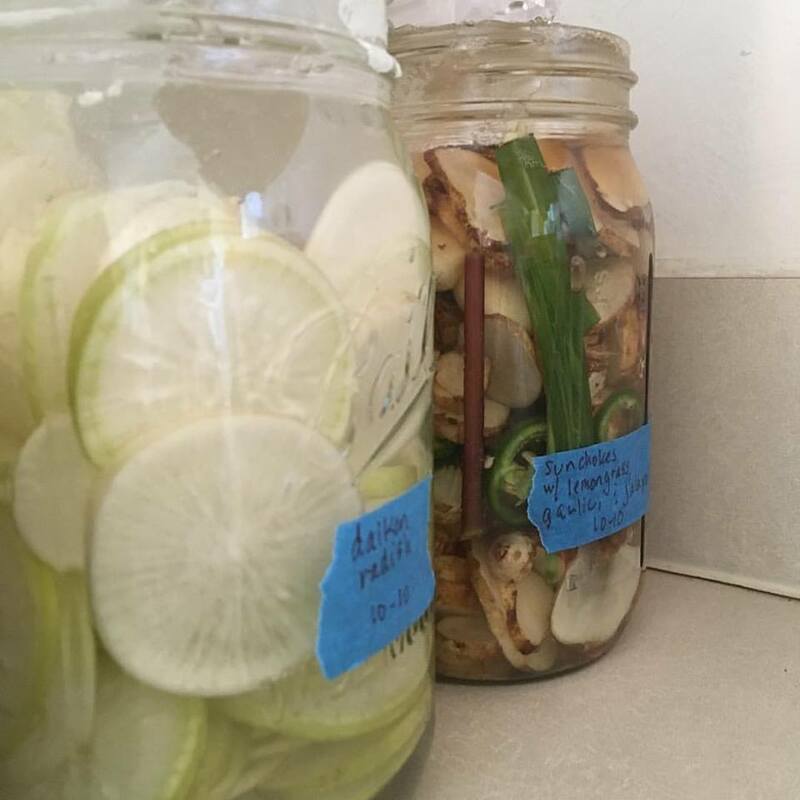 You will leave not only with a ferment of your own creation, but enough knowledge to continue to experiment with fermentation throughout the upcoming growing season using all kinds of fresh seasonal produce. Feel free to bring any favorite kitchen implements, knife, mandoline, box grater if you desire. Class includes quart jar, pickling weight, various vegetables and spices with which to create a ferment, step by step instruction on both brining and dry-salting techniques as well as info on the health benefits of lacto-fermentation. Justina Wenger-Pfarr and Donna Volles are two seasoned fermentationistas who love to talk food (with food in their mouth! ), nutrition, and ways to create health-conscious comestibles. These ladies aren't afraid to experiment with flavor!